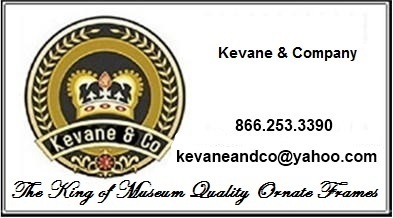 Kevane & Company has searched far and wide to find this extraordinary collection of Picture Frames! We present them here organized by size. Please be sure not to miss our entire collection of Picture Frames, Ornate Picture Frames or Large Picture Frames. In addition we have an extensive selection of frames that are avilable in any size, we have organized these in our Custom Picture Frame Collection. Please visit our page of Custom Size Picture Frames. We are quite proud of our extensive collection of Picture Frames. If there is any particular kind of frame you are looking for, but do not see here, please contact us by phone or e-mail. 45% Off - All wall picture frames are 45% Off - On Sale NOW! Our Complete 4" X 5" Picture Frame Selection! Our Complete 5" X 7" Picture Frame Selection! Our Complete 8" X 10" Picture Frame Selection! Our Complete 8" X 16" Picture Frame Selection! Our Complete 9" X 12" Picture Frame Selection! Our Complete 10" X 13" Picture Frame Selection! Our Complete 11" X 14" Picture Frame Selection! Our Complete 12" X 12" Picture Frame Selection! Our Complete 12" X 16" Picture Frame Selection! Our Complete 12" X 24" Picture Frame Selection! Our Complete 14" X 18" Picture Frame Selection! Our Complete 15" X 30" Picture Frame Selection! Our Complete 16" X 20" Picture Frame Selection! Our Complete 18" X 24" Picture Frame Selection! Our Complete 18" X 27" Picture Frame Selection! Our Complete 20" X 20" Picture Frame Selection! Our Complete 20" X 24" Picture Frame Selection! Our Complete 20" X 30" Picture Frame Selection! Our Complete 22" X 28" Picture Frame Selection! Our Complete 24" X 24" Picture Frame Selection! Our Complete 24" X 30" Picture Frame Selection! Our Complete 24" X 36" Picture Frame Selection! Our Complete 24" X 48" Picture Frame Selection! Our Complete 25.5" X 34" Picture Frame Selection! Our Complete 28" X 42" Picture Frame Selection! Our Complete 30" X 30" Picture Frame Selection! Our Complete 30" X 36" Picture Frame Selection! Our Complete 30" X 40" Picture Frame Selection! Our Complete 32" X 40" Picture Frame Selection! Our Complete 36" X 36" Picture Frame Selection! Our Complete 36" X 48" Picture Frame Selection! Our Complete 40" X 40" Picture Frame Selection! Our Complete 48" X 48" Picture Frame Selection! Our Complete 48" X 60" Picture Frame Selection! Our Complete 48" X 72" Picture Frame Selection!